Back in the private dining room in Pella, Palin shared some of those policy positions. 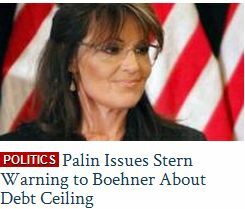 On the debt ceiling, she takes the hardline view. "It is not the apocalypse," she said, and questioned the need for the urgent negotiating sessions Republicans and Democrats were conducting in search of a debt-limit agreement (ongoing at press time). "The fact is that we have $2.6 trillion in revenue coming in, and if we just use some common sense there -- take that revenue, service the debt first, take care of national priorities -- we don't have to increase debt." LIMBAUGH: I just want to tell you with extreme confidence that if any of this happens, if there is a cave by House Republicans on this debt limit -- if Obama gets what he wants, all of what he wants, as Kristol is alluding to here, and was backed up by other reports, then you can say goodbye to the Republican National Committee. It will implode. People will stop sending it money. You can say hello to an Obama second term, because there will be a third party. The Tea Party will organize as a third party, if there is a cave on this. The White House and the Democrats may be at it again! Senate Republican leaders are worried the White House will shovel a last-minute budget deal into the Congress shortly before the August 2, 2011 debt ceiling deadline. The GOP fears an "urgent" proposal on the eve of this date will give the Congress little time to review what's in it, and the exigent nature of the deal will hamstring them into rushing it through to a vote. They are right to worry. In all likelihood, the White House (and its willing accomplices among Democratic lawmakers) will pork-up a deal with "investments" (spending increases) and tax hikes. Both are anathema to the GOP right now, and the desperadoes of the left will see this as the only way to continue 60 years of progressive policies. Any deal from the White House is bound to be a Trojan Horse. In the debt-limit talks, Republicans need to be very wary of confusing meaningless Medicare and Medicaid "cuts" with actual reforms that will make a difference. If the president and his allies have ruled out all variants of genuine reform -- and the recent Medicare proposal from Sens. Joe Lieberman (I.) and Tom Coburn (R.) certainly counts as a first step toward genuine reform -- then Republicans should make it clear that they have no incentive at all to make concessions. If that means that a "large" deficit-cutting deal can't be struck on the debt limit, so be it. A $2 trillion or $3 trillion package, heavy on tax hikes and the usual assortment of Medicare and Medicaid regulatory tinkering, should be the Republicans' worst nightmare. It will hand the president a huge political victory, leave the entitlement monolith just as it is, further entrench central government management of the health sector, and burden taxpayers even more. Politico: Boehner Walked Away From Debt Deal "Under Pressure From The Right"
Tax policy disputes were at the center of the collapse, including differences with the White House over President Barack Obama's demand that future tax reforms must maintain or increase the progressivity of the tax code. But for days Boehner has been under relentless pressure from conservatives to step away from the deal, which Saturday's Wall Street Journal editorial writers dubbed "Boehner's Obama Gamble." VARNEY: There's a great danger in that. As you approach this deadline, if you're even talking about default, as even a possibility, a remote possibility, you really spook the world's money people. You really spook them. BOLLING: I say let them default. BOLLING: Let them go. What's going to happen? VARNEY: You're a brave guy. BOLLING: What's going to happen? VARNEY: Armageddon's going to happen. BOLLING: How is it going to be Armageddon? Let's talk about that for a second. BOLLING: I know the process. And then everyone raises their hands and says, "Oh my God, the U.S. is going to default." Well -- where are they going to go? If the U.S. defaults, every other country in the world is going to default, too. BRIAN KILMEADE (co-host): That sounds like Armageddon. VARNEY: We're paying out -- yeah, exactly. KILMEADE: We can't get a credit card for seven years after that. As a country. BOLLING: We'll get it the next day. China will be on our doorsteps saying, when can we give you money again? VARNEY: OK. If you don't allow us to borrow any more money, you've got $350 billion every month going out and only $200 billion coming in. VARNEY: So you've got an immediate $150 billion cut every month. LIMBAUGH: It just -- all it means is we won't be able to borrow anymore. That's all it means. All it means is we have to live within our means. CALLER: Well I don't think that would be too bad then. CHARLES KRAUTHAMMER: The real issue here is this, what should the Republicans demand in return for the debt limit? And what I think the Republicans ought to be doing right now, the House and the Senate leadership in the week or two between now and decision day, or at least when they're going to have to come back and talk about it, is to find one proposal, a single one, not eight or 10, a range here to there, that everybody agrees on and says, here's what we want in return for the debt limit. And I think it should be something really strong like a spending cap that could require a super majority to overturn, something like that. You are not going to get something revolutionary. But you've got to start with that. HANNITY: I don't know what's worse though in my mind. I'm getting so concerned about these numbers. You know, is it worse that we default now and get our budget balanced or that America keeps continually taking on trillion in debts? It is a dangerous scenario evidenced by the S&P this week. And I just don't have the great fear that others do that this is going to be a calamity. KRAUTHAMMER: No, I think in the end, if you don't raise it, it will be a calamity. We are the number one currency, the reserve currency in the world. It gives us tremendous advantages. If there's any default even for an hour that will undo 100 years of reliability. You don't want to do that. And politically, again, if you're seen as irresponsible - you always have to look at it from the ordinary American, the centrist American, the independent who's in the middle of the road. If the Republicans are seen as irresponsible, they are going to lose in 2012 and you are going to have six years of this and we are really going over a cliff. You have to keep your eye on the prize.